Providence College senior Kelli Jenney has been Dominican educated since kindergarten. 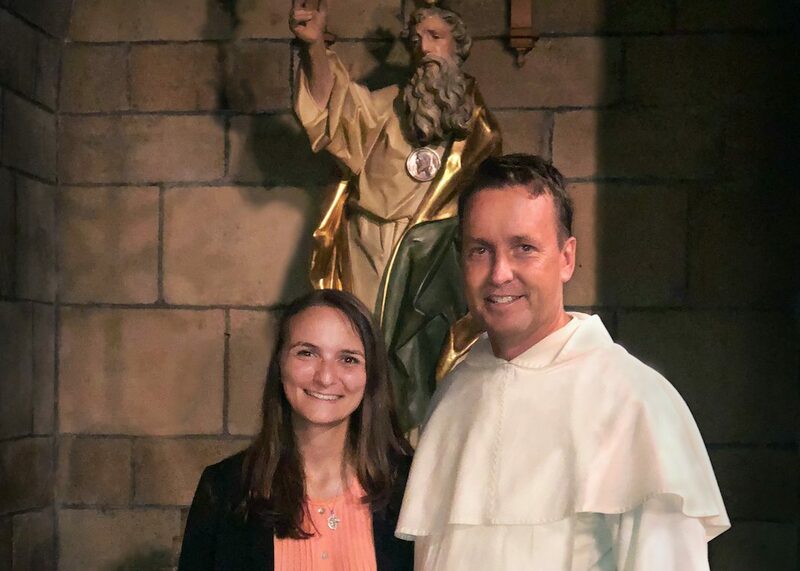 She attended high school at Saint Vincent Ferrer in Manhattan and is active in campus ministry at PC, where she assists the friars chaplains. The Saint Jude Messenger would like to share with you her family’s remarkable journey of faith. When my father was in second grade he was diagnosed with polio. It was the early 1950’s, so there was no cure or vaccine yet. My grandmother, Philomena, was very faithful and had heard about Saint Jude. In Fall River, Massachusetts, not far from their home, was a shrine to Saint Jude where a lot of miracles were happening, especially for the sick. For two years, they traveled to the shrine every Sunday and prayed to Saint Jude, the patron saint of lost causes, for my father’s healing. At this time my father had monthly doctor’s appointments and wore a leg brace. Kelli Jenney’s father as a young boy. My grandmother attributed my father’s recovery to Saint Jude, and my whole family has been devoted to Saint Jude ever since. My older sister and I both chose Saint Jude as our confirmation saint in thanks that our father was able to live. We wouldn’t be here without Saint Jude. Since then, my father has had many encounters with Saint Jude. For example, when he was a bus driver in New York City, someone walked onto the bus, handed him a relic of Saint Jude, and walked off. There have been many other little reminders for us to stay faithful to Saint Jude and to continue to pray to him as our family’s patron saint.